Former U.S. 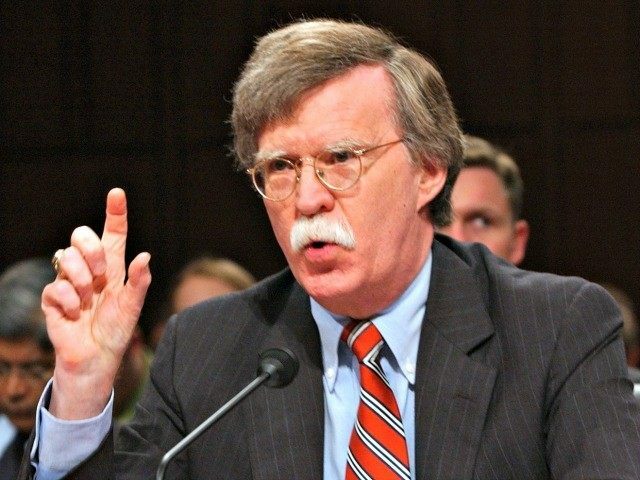 Ambassador to the United Nations and potential 2016 Republican presidential candidate John Bolton revealed on Breitbart News Saturday the launch of The Foundation for American Security and Freedom (FASF). Bolton also heads up the John Bolton PAC and Bolton SuperPACs, which Bannon referred to as “enormously successful in the 2014 election in actually getting national security into that entire debate.” According to a release from the foundation on Thursday, the PACs raised a combined amount of $7.5 million and made contributions of almost $500,000 to Republican candidates who are strong on national security policies. The foundation’s goals are more educationally oriented than the usual role of PACs, explained the former Ambassador. Americans are not going to get real information or analysis about the attacks in Paris, about Islamic terrorism, the beheading of Christians by ISIS, etc. from the administration or the media. The FASF will shed light and bring to the surface these kinds of issues, he explained. Ambassador Bolton aims to make National Security issues one of the top two or three issues in the upcoming 2016 election. He strongly believes that Barack Obama has done his best to marginalize the discussion, and the Foundation’s mission will be to elevate it. “Getting people ready for the 2016 debate is a critical function,” he maintains. Blame can also be cast on the Republicans, he explained, for not doing their job as the opposition. Republicans failed to explain to citizens that “not talking about foreign threats and challenges” doesn’t make it easier to resolve the problems abroad; it makes it more difficult. The ambassador predicts a series of threats to the United States over the next couple years. Because America’s enemies know that Obama is going to be in office only two more years and his successor may prove to be more formidable, “this is the time to do it,” he argues. A run in 2016, to correct the Obama mistakes on national security and reopen the debate on these issues, may be in the cards for the former ambassador. He and Bannon agreed that the American people, unlike the way they are often portrayed, crave the discussion and care deeply about foreign policy issues. Obama’s snuggling up to Iran, whom Bolton refers to as the “main banker” for thirty five years of both Shia and Sunni terrorist attacks, may lead to a nuclear armed Iran and destabilize the Middle-East. Moreover, Bolton would not put it past the Iranians to shuffle one of the nukes off to a terrorist group to sail into an American harbor. Marlow pointed out that in an AP article on Friday night, Obama astonishingly boasted that a nuclear deal with Iran will be his signature accomplishment for the next two years. Bolton responded that this “puts Obama in a category worse than Neville Chamberlain.” He asserted that at least Chamberlain didn’t consider his appeasement of Germany in the lead up to WW II a stabilizing factor. Rather, the British Prime Minister hoped that it would satiate Hitler’s thirst for conquest. Obama’s belief, on the other hand, that allowing Iran to be a nuclear world leader will help stabilize the Middle-East is “ludicrous,” Bolton said.